Leaving Brisbane you will follow the Pacific Motorway until reaching Beenleigh. Once in Beenleigh you will travel south, travelling through stunning landscapes as you climb the ranges to Mount Tamborine. Enjoy scenic views of the Gold Coast as you do so and stop at Gallery Walk to explore the many arts and crafts shops which make up the premier Art and Craft centre of South East Queensland. Continue your journey through to the Canungra Valley, with its historic buildings and rural setting. Sample the fruits of the vine at Canungra Valley Vineyards, or explore the grounds and search for platypus in the Canungra Creek, before taking the final winding stretch of road into the Lamington National Park. Today is a day at leisure to explore this beautiful National Park, with over 20 000 hectares of sub tropical rainforest. Hear the calls of native birds as you walk through the tree tops, 16 metres above the rainforest floor. Take a hike or bush walk along the many trails which wind through the ancient Antarctic Beech forest. Or relax and unwind in the Lost World Spa for a day of pampering (at own expense). On your way to Noosa you will be able to bypass the city streets of Brisbane taking the Gateway Motorway to cross the city. When heading north on the Bruce Highway you will come across Beerburrum State Forest. Exotic pine plantations, open forest, rainforest and coastal wallum remnants and the scenic Glass House Mountains make Beerburrum State Forest and Forest Reserve in the Sunshine Coast lowlands a picturesque place to visit. Enjoy magnificent views over the coastal lowlands from the Glass House Mountains or Beerburrum Mountain Lookouts. Walk through scribbly gum and wet sclerophyll forests around Glass House Mountains Lookout. Travel along the Bruce Highway again to the north making your way to Hervey Bay. 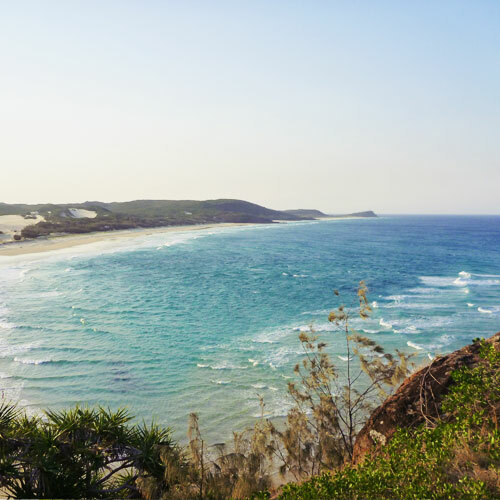 Continue onto the River Heads village for the departure to Fraser Island, the world’s largest sand island, at 123 kilometres long, and a haven for nature lovers. Check into the mainland terminal, unload luggage and then park your car (choice of car parking available – own expense). Board the Kingfisher Bay Ferry for the transfer across to Fraser Island. On arrival on Fraser Island check-in and then the rest of the day is at leisure to start exploring the Island. Depart Fraser Island and return to River Heads village by ferry. On arrival, collect your rental car and continue south down the Bruce Highway enjoying much of the same scenery as before. The eye catching views of National Parks, rolling hills, and Queensland Bushland areas. About halfway you’ll come across a lovely old mining town called Gympie. In Gympie you’ll find museums and statues dedicated to the miners who worked during the gold rush days. Stop to explore more of the Sunshine Coast, including the hinterland towns of Montville and Maleny, before continuing south along the Bruce Highway back to the bustling city of Brisbane.